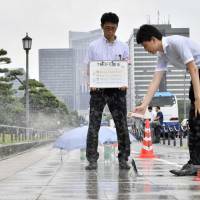 The Tokyo Metropolitan Government on Monday tested sprinklers on a street in the capital to see how effective it could be in countering scorching heat as officials look for ways to keep athletes and spectators cool during the 2020 Tokyo Games. 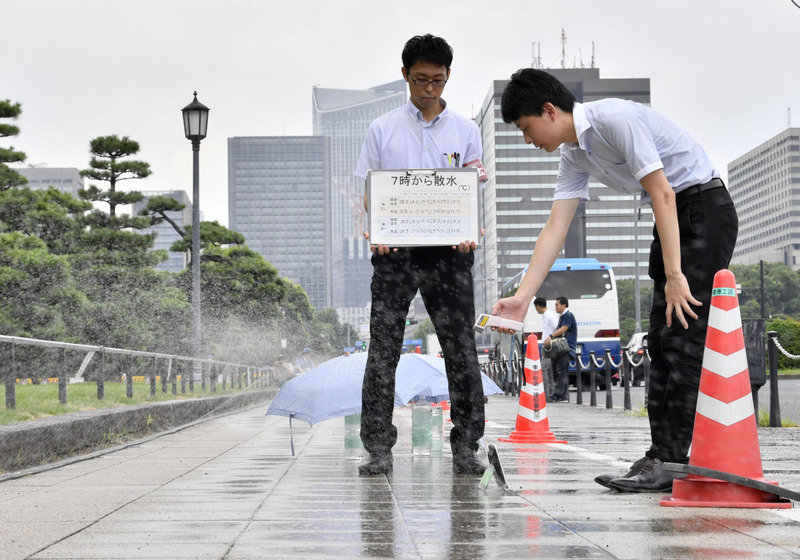 The experiment, conducted on a pedestrian walkway along a road where competitive walking will be held during the games, showed sprinkling water will keep the temperature on the street surface up to around 5 C cooler than the air temperature. The metropolitan government carried out the test using perforated hoses that are typically used by farmers to irrigate crops. Some locations had their sprinklers activated from 4 a.m. while sprinklers elsewhere were activated at 7 a.m. At some test areas, sprinklers weren’t used at all. In areas where sprinklers were used from 4 a.m., the surface temperature was about 5 degrees lower than the air temperature. Other locations that were sprinkled also recorded temperatures between 27 and 29 degrees, even as the air temperature soared above 30. In areas where no water was sprinkled, the surface temperature was higher than 30 degrees. It was cloudy when the experiment was conducted and an official in charge of the experiment said the results could be different in sunny conditions. Tokyo is already planning to install mist showers and special pavement coverings to reduce road surface temperatures. Heat has been a major concern for organizers of the games as the country endures a scorching summer that saw the mercury soar to a record high of 41.1 degrees last month in Kumagaya, Saitama Prefecture. Over 130 people died and 71,000 others were taken to hospitals due to heatstroke or heat exhaustion between April 30 and Aug. 5. Olympic heat wave fears: What steps can Tokyo take?